All kinds of amazing, unusual, milestone numbers have been put up by the Yankees of New York. Some of the numbers spark memories, others controversy, others surprise. Herewith for you reading pleasure the newest edition. Enjoy—and pass on other numbers to your loyal scribe. Record set for most RBI’s in consecutive games, Babe Ruth 1931. Most walks in one inning, the third, Yankees versus Senators, September 11, 1949. Most at bats one game, Bobby Richardson, June 24, 1962, game against Detroit went 22 innings. Pitcher Ron Guidry was the eleventh Yankee Captain from March 4, 1986 to July 12, 1989. 11.8—Babe Ruth career home run rate per at bat. The number of ballparks Babe Ruth hit at least one home run in. The number of times Babe Ruth led the American League in homers. Billy Martin’s rookie uniform number. First baseman Don Mattingly was the 12th Yankee Captain from February 28, 1991 to October 8, 1995. Home plate was moved 13 feet forward in 1924, eliminating the “bloody angle” in the right field corner of Yankee Stadium. Bill Dickey holds the record catching over 100 games 13 consecutive seasons. Number of seasons Joe DiMaggio played for the Yankees. 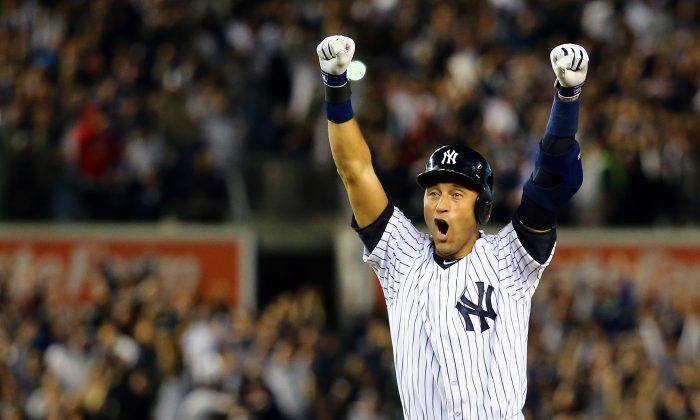 Derek Jeter was the 13th Captain in Yankee history from September 3, 2003 to season’s end 2014. The number of players the Yankees lost in the 1918 season to military service. Team record for runs scored in an inning: fifth inning against Washington, July 6, 1920. Yogi Berra stayed away from Yankee Stadium for 14 years after George Steinbrenner fired him through an emissary 16 games into the 1985. 14 percent—In 1927, Babe Ruth blasted 14 percent of all the home runs recorded in the American League. Babe Ruth three times homered 15 times in one month; DiMaggio and Maris accomplished that feat once. Lou Gehrig, career steals of home. The number of consecutive seasons Yogi Berra was a member of the American League All Star team. He actually made 18 teams in all. July 18, 1999—David Cone’s perfect game against the Montreal Expos was the 15th regular season perfect game. $15.00—Bob Sheppard’s per game earning in 1951 when he began working for the Yankees, allowing for inflation this is approximately $138 in today’s dollars. Thurman Munson retired uniform number. Babe Ruth, total World Series home runs, second place all time. Most runs allowed by Yankees in post-season competition, Game 6, 2001 World Series.